The FOR-A HVS-6000 At the upcoming NAB Show in Las Vegas, FOR-A will demonstrate its end-to-end line of video production tools and unveil several solutions, including video switcher, frame rate converter, routing switcher, and IP control software technologies. FOR-A’s booth will place an emphasis on 12G supported products and solutions that integrate baseband and IP for a wide variety of applications, including live studio and sports production environments. The company will also showcase its commitment to developing technologies that support UHD resolution, high dynamic range (HDR), and wide color gamut (WCG), as well as various codecs. FOR-A will exhibit in booth C5117 during the show, which takes place April 9-12. 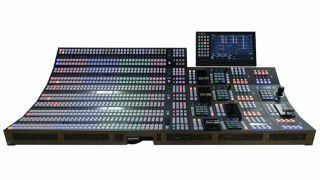 FOR-A’s newest switcher, the 12G-SDI supported HVS-6000, will make its NAB show debut. The latest in the company’s line of HANABI video switchers, the HVS-6000 offers 4K support, maximum 48-input/24-output in 12G, and scalability to users looking to transition to 8K further down the line. The 2 M/E HVS-6000 offers frame synchronization, frame buffer, 3D DVE, and four keyers per M/E with DVE function and 4 DSKs. The new solution will be shown in the booth’s video switcher area alongside its existing 4K supported units, including the HVS-2000, which offers the performance of a 7 M/E switcher; the compact HVS-490; and the portable HVS-100. In its 12G/IP technology area, FOR-A will showcase its entire USF-Series of universal systems frames and introduce the USF-106UDC-12G 4K up/down converter—which offers interlace/progressive and up/down conversion for a range of signals from SD and HD to 4K. Other new solutions in this area will include the MFR-6000 SD/HD/3G/6G/12G router with a matrix of up to 144x144 and MBP-1000VS-12G/IP 4K video server, which offers multi-input/output 4K and HD support and ingest, playout, and 4K recording functionality. Existing products that FOR-A will show in this booth area include the ESG-4200 multi-rate 12G/IP 4K test signal generator, USF-10IP series IP/SDI or IP/IP gateway, MV-4320 multiviewer supporting 12G-SD I/Os, and MFC-2GB 12G-SDI/Quad Link 3G-SDI converter. FOR-A will also unveil a prototype of new IP/baseband management/control software. In the company’s HDR technology area, FOR-A will introduce a system package that includes the HVS-490 video switcher, MFR-3000 routing switcher, MV-4200 multiviewer, and ClassX content creation and graphics playout solution. Another solution to be shown in this section is the InSync MCC-4K motion-compensated converter—a hardware-based unit that offers conversion from any 3G/HD-SDI frame rate to any other 3G/HD-SDI frame rate, as well as up/down conversion to and from 3G/HD and UHD. The unit is designed for live broadcast environments and also offers support for quad link 3G-SDI of two-Sample Interleaved (2SI) or Square Division (SQD) format, as well as single-link 12G/6G-SDI and SFP connectivity. FOR-A’s NAB camera stage booth area will feature the FT-ONE-LS-12G high-speed full 4K camera, which supports full 4K shooting in maximum 500 frames per second or up to 1,200FPS high frame-rate shooting in 1080p, offers the ability to independently move the camera head around to capture the next crucial shot, and features simultaneous output of live and super slow-motion video. Alongside the FT-ONE-LS-12G will be the ZE-ONEA 4K extraction system with new automatic motion-tracking function, RFC-ONE real-time flash corrector, and FC-ONE flicker corrector. In its virtual system area, FOR-A will demo the VRCAM-NX sensor less virtual studio system and Brainstorm Infinity Set advanced virtual system. The FVW-700-4K 4K/HD telestrator will also be showcased in this area. The FVW-700-4K enables users to annotate and draw on video using a touchscreen computer monitor or wirelessly connected tablet, and the unit recently began shipping.